In 634, Oswald formed his own army, returned to Northumbria, defeated King Cadwallon of Gwynedd, and took the throne of Northumbria. Prior to the battle, he had received a vision of Saint Colman of Lindisfarne; he had also erected a large cross on the field on the night before, attributed his win to his faith and the intervention of the saint, and the victory is known as the Battle of Heavenfield. Brought Saint Aidan of Lindisfarne to Northumbria as bishop to evangelize the kingdom. Built churches and monasteries in his realm, and brought in monks from Scotland to help establish monastic life. Married the daughter of King Cynegils of Wessex, and convinced Cynegils to allow Saint Birinus to evangelize in that kingdom. Due to victories in combat, and family alliances, Saint Bede claims that Oswald was recognised as Bretwalda by all of Saxon England. His royal standard of purplish-red and gold forms the basis of the coat of arms of modern Northumberland. Because he was killed in battle with invading pagan forces, he is sometimes listed as a martyr. Noted for his personal spirituality, piety, faith, his devotion to the kingdom, his charity to the poor, and his willingness to take arms to defend his throne. Oswald was a king and a saint, and made a large mark in his short time; inevitably, large tales are told of him. • One Easter he was about to dine with Saint Aidan of Lindisfarne. A crowd of poor came begging alms. Oswald gave them all the food and the wealth he carried on him, then had his silver table settings broken up and distributed. • Saint Aidan was so moved by the king's generosity that he grasped Oswald's right hand and exclaimed, "May this hand never perish!" For years after, the king was considered invincible. The hand has, indeed, survived, as it is enshrined as a relic in the Bamburgh church. • Oswald's body was hacked to pieces on the battle field where he fell, and his head and arms stuck on poles in triumph. One arm taken to an ash tree by Oswald's pet raven. Where the arm fell to the ground, a holy well sprang up. • Once a horseman was riding near Heavenfield. The horse developed a medical problem, fell to the ground, rolling around in pain. At one point it happened to roll over the spot where Oswald had died, and was immediately cured. • The horseman told his story at a nearby inn. The people there took a paralysed girl to the same spot, and she was cured, too. • People began to take earth from the spot to put into water for the sick to drink. So much earth was removed that it left a pit large enough for a man to stand in. • Oswald's niece wanted to have the king buried at Bardney Abbey, Lincolnshire. The monks were reluctant as they were not on good terms with Northumbrian overlords, and when the burial train arrived at their door after dark, they refused to open to let the party in. However, the coffin emitted a bright light that shone into the heavens. The monks considered it a sign, vowed never to turn away anyone for any reason, and allowed the burial. • When the monks washed the bones prior to enshrinement, they poured the water onto the ground nearby. Local people soon learned that the ground had power to heal. • A sick man who had led a dissolute life drank water which contained a chip of the stake on which Oswald's head had been spiked. The man was healed, and reformed his life. • A little boy was cured of a fever by sitting by Oswald's tomb at Bardney. • Pieces from the Heavenfield cross were claimed to have healing powers. • Healing powers were claimed for moss that grew on the cross. • A plague in Sussex, England was stopped by Oswald's intercession. • Archbishop Willibrord recounted to Saint Wilfrid a series of tales of miracles worked in Germany by Oswald's relics. Born to a pious and fairly wealthy family. Known for his hard work as a student and seminarian, and for his problems controlling his temper. Ordained on 19 September 1903 in the diocese of Vic, Spain. Rural parish priest for several years. Joined the Oratorians in Vich 1907, and ministered to the people of that city. He started a confraternity for married men under the patronage of Saint Joseph to revitalize the spiritual and parish life of working men who routinely fell away from an active faith life. Taught theology at the local seminary. Apostolic administrator of Ibiza, Spain, an impoverished diocese that had been without a bishop for 69 years, and titular bishop of Selymbria on 16 February 1928. When the anti–Catholic republic assumed power in Spain in 1931 and began issuing laws shutting down the Church and secularizing all things, Father Salvi continued his work, and encouraged his flock not to abandon the faith in the face of yet another persecution which would pass as all others had done. Bishop of Lleida, Spain on 28 January 1935, a see he held when the Spanish Civil War broke out and the anti–Christian persecutions erupted in open massacres and martyrdoms. Arrested with a group of other Christians, Father Salvi spent his time in jail, including the ride to the cemetery where they were to be executed, ministering to his fellow prisoners. He was forced to dig his own grave, and was offered freedom if he would renounce Christianity; he declined but asked to be the last to die so he could pray for and bless each of the other victims as they died. One of the milita men objected and shot up Salvi’s right arm to stop his blessings; he continued with his left. Martyr. A feast that commemorates the dedication of the church of Santa Maria Maggiore on the Esquiline Hill in Rome, Italy. The church was originally built by Pope Liberius, and was known as the Basilica Liberii or Liberiana. It was restored by Pope Sixtus III, and dedicated to Our Lady. From that time on it was known as Basilica S. Mariae or Mariae Majoris. Since the seventh century it was known also as Maria ad Praesepe. The appellation ad Nives (of the snow) originated a few hundred years later, as did also the legend which gave this name to the church. The legend says that during the pontificate of Liberius, the Roman patrician John and his wife, who were without heirs, made a vow to donate their possessions to Our Lady. They prayed that she might make known to them how they were to dispose of their property in her honour. During the night of 5 August, snow fell on the summit of the Esquiline Hill. In obedience to a vision which they had the same night, the couple built a basilica in honour of Our Lady on the spot which was covered with snow. From the fact that no mention whatever is made of this alleged miracle until a few hundred years later, not even by Sixtus III in his eight-lined dedicatory inscription, it would seem that the legend has no historical basis. Originally the feast was celebrated only at Santa Maria Maggiore. In the fourteenth century it was extended to all the churches of Rome, and finally it was made a universal feast by Pope Pius V. Pope Clement VIII raised it from a feast of double rite to double major. The Mass is the common one for feasts of the Blessed Virgin; the office is also the common one of the Blessed Virgin, with the exception of the second Nocturn, which is an account of the alleged miracle. The congregation, which Pope Benedict XIV instituted for the reform of the Breviary in 1741, proposed that the reading of the legend be struck from the Office, and that the feast should again receive its original name, Dedicatio Sanctae Mariae. Benedictine monk at the Saint-Mesmin Abbey (also known as Micy Abbey) in the early sixth-century near Orleans, France. Friend and brother monk of Saint Avitus. Spiritual student of Saint Maximinus. Feeling the need for solitude, he left the abbey to live as a hermit near Sologne-sur-Loire, France. Highly esteemed by locals for his holiness of life. Ninth-century legend fills in the gaps in his biography with a narrative involving Saints Viator, Avitus and Mesmin, but it appears to be pious fiction. The town of his tomb changed its name to Saint-Viâtre in his honour in 1854. Born poor. Married at 15 to an Italian gentleman, and abused for years by her husband for her attachment to the Church and her perceived ministry to the poor. She gave up shoes, dressed and appeared as a beggar to better associate herself with the poor. Widowed. Mercedarian friar. In 1382 he ransomed 48 Christians enslaved by Muslims in Almeria, Spain. Sent in 1386 to ransom Christians in Tunis (in modern Tunisia), he was abused and occasionally imprisoned as he made his way across north Africa, but he did complete his mission. Later retired to spend his final years in the Mercedarian convent of Santa Maria dei Miracoli in Montflorie, Aragon (in modern Spain). Missionary to the European continent with Saint Boniface. Chosen archbishop of Rheims, France in 744 by Pope Saint Zachary and the Council of Soissons. He was unable to take over the see as it was occupied by hostile forces supporting the self-appointed bishop Milo. Retired as a Benedictine monk at Lobbes Abbey in Belgium, and was later chosen abbot. Priest in the diocese of Rouen, France. Imprisoned on a ship in the harbor of Rochefort, France and left to die during the anti-Catholic persecutions of the French Revolution. One of the Martyrs of the Hulks of Rochefort. Born to the Burgundian nobility. Bishop of Viviers, France for 27 years. Returned the liturgy to places that had fallen away from the Church, restored clerical discipline, and revitalized the faith throughout his diocese. Attended several synds, and was very active in the synod of Epaone in 517. Bishop of Teano, Italy; that's really all we know about him. Legend says that he became bishop after killing the dragon that the locals cared for and worshipped; this is usually metaphor for defeating paganism in the area. First bishop of Châlons-sur-Marne, France, serving in the latter 3rd century. Saint Gregory of Tours wrote about Memmius as a miracle worker. Daughter of Filtazius, she was raised in a Christian home. Married and converted Saint Gregory of Nazianzen the Elder. Mother of Saint Gregory Nazianzen, Saint Caesarius of Nazianzen, and Saint Gorgonia. She outlived her husband and the latter two children. One of the 72 original disciples sent out to spread the faith. Addai was sent by Saint Thomas the Apostle to heal King Abgar the Black, a correspondent of Jesus' who had fallen ill. Addai stayed to evangelize, and converted Abgar and his people including Saint Aggai and Saint Mari. Known as one of the great apostles to Syria and Persia. Born to the Egyptian mobility. Worked with Saint Reticius. 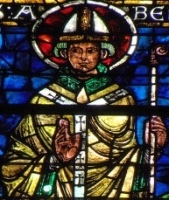 Bishop of Autun, France from 314 to the end of his life; he served for 36 years. Miracle worker. Career soldier in the army of Constantius Chlorus. When Julian the Apostate renounced Christianity, he ordered all his subjects to make a sacrifice to idols. Eusignius refused. Martyr. Converted by and spiritual student of Saint Addai. Missionary around Nisibis, Nineveh, and along the Euphrates. Won many converts, destroyed pagan temples, and built churches, monasteries and convents. Known as one of the great apostles to Syria and Persia. Mercedarian friar. Bishop of Laodicea, Syria. Zealous evangelist. Miracle worker. Royal jeweler to King Abgar the Black. Converted by Saint Addai. Bishop, and successor to Saint Addai as evangelist. Spiritual director of Saint Mari, whom he dispatched on missionary work. Martyr. Abbot at Ardoilen, Galway, Ireland. Camaldolese monk at Florence, Italy. Noted for his devotion to the Sacred Will of God. Bishop of Cambrai-Arras, France from c.830 to 863. Twenty-three Christians who were martyred together in the persecutions of Diocletian.